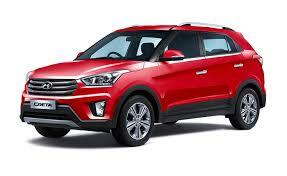 From nose to tail the Hyundai Creta has been designed keenly. There’s not a single angle from where it looks disproportionate or bland. The designers have done a fabulous work with the Fluidic Sculpture 2.0, which makes it look like Santa Fe’s younger brother. The lean and aggressive front styling consists of a shiny and wide three-slat grille with the Hyundai badge sitting proudly in the middle. The sleek projector headlights with LED DRLs are the party piece of the front styling. The muscular bumper integrates the faux silver skid plate and vertically stacked foglamps. Just notice how the bonnet runs straight and suddenly cuts flat from the grille, this makes it look like a true blue SUV. The gearshifts on the six-speed manual ‘box are positive, with precise and short throws. As for the six-speed automatic on the 1.6 diesel, in normal D mode with a relaxed driving style, it shifts up very early, so progress is relaxed but adequately rapid. Thanks to the torque converter masking the engine’s initial turbo lag, the power delivery is quite linear, making this Hyundai SUV easy to drive. The gearshifts are smooth and remind you that refinement and comfort have been given more priority than ultimate performance. It does help that you can shift gears manually via the gear lever when you need that sudden acceleration for overtaking. Even in this mode, however, it will automatically upshift at the red line, and it’s slow and reluctant to downshift manually. It’s a very old-school slush-box, and for most this should be fine, but if you want to drive quickly, it’s nowhere as good as something more modern – like VW’s DSG dual-clutch unit.